Grocery shopping takes time, preparation, patience, and organization. But throw kids in the buggy (or cart) with you, and usually you end up with a big old, stressful mess. Take it from a mom with three kids under the age of 5; I know firsthand that it can be done happily and without tantrums (well, for the most part). But it’s taken some practice. 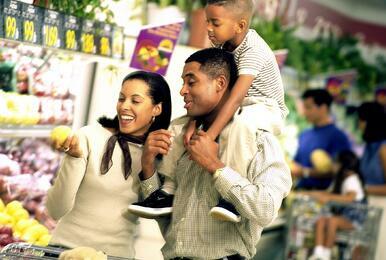 Our family’s weekly shopping trip is usually done all together on Sunday mornings, straight from church to the store. So as we stroll down the aisles with our two separate carts (because how else will we fit the kids and the food? ), my husband and I are ready to take on the dreaded shopping trip by following these three essential rules for surviving grocery shopping with kids. Never shop hungry. If I even think about letting my kids go into that store on an empty stomach, I might as well throw up my white flag right then and there. It’s not a good idea! In fact, it’s not good for adults to go food shopping hungry, either! Research (and, well, common sense) shows you will end up with way more food than you intended, just because your judgment is impaired by hunger pangs. Be prepared. The night before or morning of, I make my meal plan for the week ahead. I decide what we are eating for every meal, taking into consideration items I have in my fridge, freezer, or pantry that need to be used up. Once the meal planning is done, my list is constructed from there. I separate my list in order of how I go through the store (my game plan, so to speak): first the produce, then the bakery, then to the deli and meats, and so on. This is obviously individual to you and your store, but if you frequent the same place each week, you catch my drift. That way each section has the items listed there I need. And it prevents me from getting to the opposite side of the store and running around like a madwoman looking for that dang ketchup I forgot! Instead of hiring your standby babysitter for the weekly food trip, I say get your whole family involved in your shopping and meal preparation. If children learn from you how to shop, prepare, and enjoy healthy foods at a young age, you are instilling healthy habits that will hopefully last their lifetime. Happy shopping! Looking to better track your dietary habits? Check out NIFS Dietitian, Angie Mitchell's top 4 apps for better eating! Download by clicking below!